I feel both of these tanks need a buff. TUSK 2 need heavy nerf. well the Tusk version is mostly just armor and protection add on so damage and seed shouldn't be a change so yes I somewhat agree with bas a nerf for m1 but a T90 improves a more rounded balance so a slight buff. To be honest, I feel that both are pretty much balanced at their respected tiers. Guys, i don't think TUSK ´Need to be nerfed, as like as Armata. TUSK is modular armor package. Edited by CaptainPrice, 09 October 2017 - 08:12 PM. Would you stop complaining about tanks already, all it does is make it worse, look at Armata, it's trash now! People complained about TR-85 and Al-Kahlid, what happened? Basically nothing! I feel that tusk2 armour was basically design to get ready combat readiness test. I.e it was basically fitted with extra armour to provide ceramic platesprotectionn so that it can get and extra airpockets+highly advanced reactive components of armour protected from any difficult situation it might be. This gives higer chances to provide protection from (rpg-7or8) new several types of various ammunition and many more!! Edited by EquablezMonsterz, 18 May 2018 - 04:32 PM. I wonder if the Chally 2 TES will be in a similar predictement in game with buffed damage and buffed mobility despite it being extra armor strapped on. Yeah you're correct. But main battle tanks are not only created for speed. Although these tanks are ratherly slow but it's performance are very awesome. Now let's see what we are expecting from challenger2 tes-megatron. I already know dude . I know much more detail not only this vehicle but all the different types of vehicle including from small to small parts. 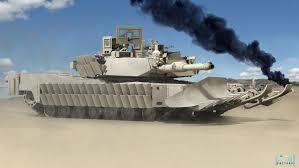 Now let's see about new various innovation of challenger2 tes-megatron. Rather than that it's speed. Whatever it is but M1A2 Abrams (tusk) is deadly that we are expecting more than it . Edited by EquablezMonsterz, 19 May 2018 - 04:09 PM. It's a nice question only developers could have these innovation about these features. I'm having a doubt that why M1A2 ABRAMS (TUSK) has the engine sound like diesel, why they didn't fitted gas-turbine sound like previous m1a2 Abrams engine sound? Edited by Aditya sunani, 20 May 2018 - 04:51 AM.